Front Row: Robert Geddes, Joe Small, (seven unknown), Frank Gribben, Tony Rezcek. Monkland Harriers was one of Scotland’s oldest running clubs, having been an offshoot of Clydesdale Harriers, and had provided many Scottish Internationalists up into the 1920’s including Olympian Sam Stevenson and Scottish Internationalist Matthew Forrester. Their stamping ground was the Coatbridge area of North Lanarkshire and the club was doing very well indeed at the period Joe is talking about. In my role as last of the dinosaurs, I felt that it was a pity that they lost their identity when the Clyde Valley amalgamation took place and they were swept up with Motherwell, L & L, Airdrie and a couple of other clubs. The new club was undoubtedly successful and Joe has promised to talk about it in another essay. I look forward to seeing it! “Having looked in detail at the stars of our sport, we’ve decided it was time to give a mention to some of the lesser lights, not the big names but those runners who provided the essential back up in team races, relays as well as competing to a good standard in their own right. I’ll concentrate on the men I trained and raced with over the years with both Monkland Harriers and Clyde Valley AAC. 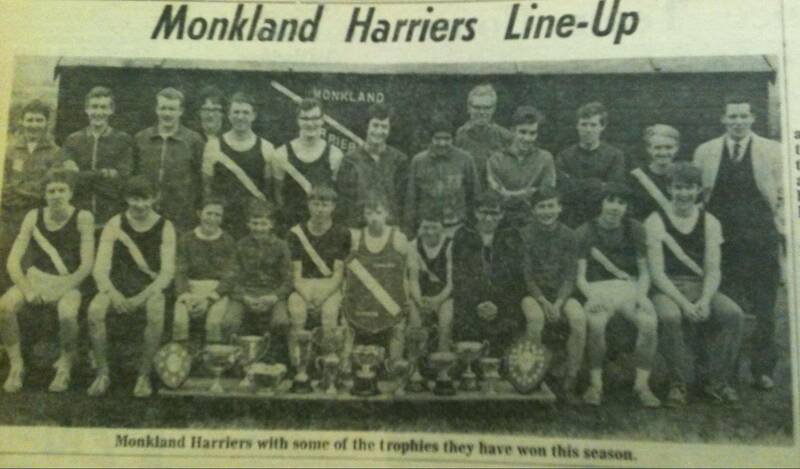 I first joined Monkland Harriers around 1967, aged 13. The club was just coming out of a period in the doldrums. By organising the local schools races membership had picked up and a significant number of talented athletes were signed up. The club was predominantly road/cross-country with a few sprinters and throwers. The secretary was that weel-kent face Willie Drysdale, still active I believe with Law & District. The “trainer” was Andy Arbuckle best known for applying a freezing cold sponge in the face as you crossed the finish line! With Jim Brown and Ronnie McDonald competing in the senior ranks for the first time, the usual four man team consisted of these two together with Willie Drysdale and Eddie Devlin. Eddie was one of many excellent runners to come out of St Patrick’s High School in Coatbridge. To name a few, Eddie, Ronnie McDonald, Martin McMahon, Paul Bannon, Mark Watt, Frank Gribben, Jim Burns, Neil Agnew and myself! I’ll use principally the Edinburgh to Glasgow relay as a measure of the progress of the club over the years. With eight runners in a team, it gives a good overall view of the state of the club. In 1971 the club was invited to compete in the E-G (or News of the World as it was then called) relay for the first time in a number of years and the names of those who competed in that event give an indication of the standard of runners at that time. Together with Drysdale, Brown, McDonald and Devlin, the remaining four were a young Peter Preston, later to join Cambuslang, Tommy Callaghan, who coached both Jim and Ronnie, policeman Neil Hare and John McGleish. They performed well achieveing a commendable ninth place. Also in this season, the club won the National Junior Cross Country title with Jim Brown (1st), Ronnie McDonald (3rd) backed up by Peter Preston and Danny Nee. At this point it’s worth looking at the record of two men in particular in the E-G. Over the years Monkland and Clyde Valley competed in the race on 14 occasions. Both Jim Brown and Eddie Devlin had a 100% record, running in all 14 occasions, with two wins, one second and three third place finishes. Eddie was an excellent all round athlete, encompassing everything from a fast 800m of around 1:54 up to a 2:25 marathon, but he seemed always to peak for the E-G. The 1972/73 season saw the first appearance of Ian Gilmour as a senior, but in spite of his good run on the Second Stage of the E-G, the club dropped one place to tenth. Other newcomers that year were myself, (the first of 10 appearances in the race) and Willie Devlin (brother of Eddie, a very strong forceful runner, who turned out for the club in big races, even after moving south for employment reasons. Not a newcomer, but in the team was Willie McBrinn, a veteran even then, but with many age group records to come in the years ahead. As I write, I understand he is still looking for a world marathon record for an 80 year old, in spite of recent serious ill health. When you went out for a training run with Willie, you knew you were in for a seriously hard run. At some point in the proceedings, he would throw in a fast mile or two to stir things up. The junior squad repeated the National win, again with Brown, McDonald and Preston from the previous year, with myself making up the four man team. The next year saw six of the previous year’s eight back in place. Peter Preston had left to join Cambuslang. In came Tommy Callaghan, his first appearance since 1966. In addition to coaching and competing, Tommy was also active on the committee of the club, as were a number of runners at that time. Another new face was John Davidson, an Anglo-Scot who had signed on after a good performance in the National. He only ran a few races before disappearing from the scene. These changes saw an improved performance as the team finished in eighth place and won the Most Meritorious Performance. There are several very well known names in there – and I probably raced all of them at one time or another. I remember Eddie Devlin as a very good runner indeed but a bit erratic – at times he did not do himself justice. Tommy (TBP) Callaghan was someone I raced fairly frequently – a slight figure who always paced his races well and often came through at the end of an event. Peter Preston was never as good as Eddie or Joe himself, he was a regular club runner though and as such the kind of athlete most clubs like to have around. Willie Drysdale is indeed still running for Law & District AAC and is to be seen at all the major and veterans events over the winter and on the roads in summer. Willie used to finish down the field in most races until he started training with John Anderson and the result was a massive improvement – I believe that John even had him doing weight training. From being a middle of the field runner, Willie started to figure in the first 10% of the field and even took third place in the West District 6 Miles championship at a time when the event was taken seriously. When I taught for a short period in Glasgow and trained at lunchtime from the Strathclyde University gym at lunchtime, Willie was an ever present and his call of “C’mon boys, screw the nut!” as we went along Alexandra Parade to the park and golf course was frequently heard. Mind you, I still don’t really know what it means ……………. Willie McBrinn I first saw in action when David Bowman was trying to talk me into doing the marathon and we went through to follow the Falkirk to Meadowbank marathon in the early 60’s. The favourite Ian Harris dropped out and I think Gordon Eadie won but Willie finished second after a very steady race with no sign of weakness anywhere despite the heat on the day. We became friends and took part in many of the same road races. He was a great competitor and well liked by everybody in the sport. But Joe has left out a man who won medals in both E-G and National championships – namely, himself! Joe was a good runner for Monklands and then Clyde Valley running at least ten times in the Road Relay and winning three bronze and one gold team medal in a Clyde Valley team that was one of trhe most difficult in the country to be selected for! I look forward to any comments on his own running in the story of the Clyde Valley supporting cast! Guys like these shouldn’t be forgotten – thanks Joe for reminding us.